You are here: Home / Diet & Lifestyle / Is Fasting Right for You? There are many different types of fasts and while they can be beneficial, they may not be best for everyone. We’ll discuss several different types of fasts, who can benefit from intermittent fasting, and which fast may be best for you. If you need help with determining the best fast for you, click here. Intermittent fasting is a period of time where you don’t consume any food and you just consume liquids. 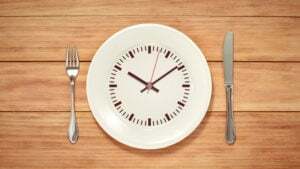 Intermittent fasting has become popular because it shows tremendous promise for fat loss, preventing cancer, building muscle, and increasing resilience. There are different types of fasts ranging from water only to bone broth, butter coffee, masters cleanse, or elemental diets. Fasting can be very effective for metabolic conditions such as obesity, high blood pressure, high triglycerides, and fatty liver. These conditions are linked to high insulin, and fasting can be helpful for this. However, fasting may be risky and problematic for other people. At the other end of the spectrum are those who exhibit signs of burn out. This presents itself as conditions such as adrenal fatigue and chronic fatigue. If you’re someone who experiences a lot of fatigue, you’re under a lot of stress, and you feel depleted, then fasting may not be a good option for you. Also, if you’re under weight, then fasting would not be recommended. In this group of people, it’s typically cortisol and stress hormones that are the problem, and fasting tends to increase the levels of stress hormones in the body. There are two ends of the spectrum. Those with insulin related disorders may benefit from fasting, while those with cortisol imbalances may worsen with fasting. There’s also the group of people in the middle of the spectrum. These are people who might be present with gastrointestinal issues such as IBS and IBD. This group of people may do well with a modified fast. A modified fast is where you consume a high nutrient liquid. Elemental and semi-elemental diets are hypo-allergenic, gut-friendly meal replacement shakes that are very easy to digest; they give your gut a break, but you have sufficient calories, so you don’t activate the stress response. The length of a fast can vary greatly depending on the purpose and the conditions. It can be as short as fasting through one meal, or it can last several days or weeks. It’s advised that you work with a skilled practitioner if you’re fasting for an extended period of time. Bulletproof Fasting is the same as intermittent fasting, except you consume a cup of Bulletproof Coffee in the morning. The healthy fats from grass-fed butter and MCT oil give you a stable current of energy that sustains you through the day. No snacking after dinner – go to bed whenever you want. Bulletproof Coffee is a mix of brewed Upgraded Coffee beans, grass-fed butter, and MCT Oil. You can find the complete recipe here. Drink as much Bulletproof Coffee as you like in the morning. You can have another cup before 2:00 PM if you get hungry. No coffee after 2:00 PM or you won’t sleep. This is not necessary to gain muscle and lose fat, but it helps. If you’re going to work out, lift something heavy right before you break the fast in step 3. You will need to sleep more if you exercise. This means you’ve not had anything to eat except Bulletproof Coffee for 18 hours. This should occur from the time you wake, through the morning, and into the afternoon. If 18 hours is too long, start with a shorter fast and increase from there. The number of meals you eat during this time is irrelevant, as is the amount of calories. To dissolve and eliminate toxins and congestion that have formed in any part of the body. To cleanse the kidneys and the digestive system. To purify the glands and cells throughout the entire body. To eliminate all unusable waste and hardened material in the joints and muscles. To relieve pressure and irritation in the nerves, arteries, and blood vessels. To build a healthy blood stream. To keep youth and elasticity regardless of your years. To purify mind, thoughts, and to get in touch with your spirit. Consume at lease 60 oz a day for a period of days, usually 10. No food is consumed during this period. Elemental diets have been in use since the 1940’s in hospital settings. More recently, interest in elemental diets has increased for use in various conditions of gastrointestinal/digestive impairment under medical supervision in outpatient settings. ensure comprehensive support as a sole source of nutritional intake for limited periods. It’s recommended to work with a skilled practitioner to determine the best elemental diet protocol for you. Making “bulletproof” coffee is one way to gag down plain MCT oil (coffee and tea are allowed on the elemental diet). The bone broth must be unadulterated, especially onions or garlic. I season it with salt and am thankful. The fast makes me very weak but the bone broth is more strengthening than the complete amino mixture for me. This is possibly because I will actually drink the bone broth whereas I would skip the elemental mixture because I found it so repulsive. Not everyone does. I also added grass-fed collagen powder to my broth and coffee. The Great Lakes brand is very pure. I think I might have beat it this time as my symptoms are much improved. I found It is important to follow up with a good (soil based) pro-biotic every day. Though if you have adrenal or thyroid issues a long bone broth fast could be weakening. How long did you do it? I am doing the ED now and I feel the parasites crawling in my body. I am trying to get educated about fasting and keto living and your article is great. I have two teens coming up for college and a very limited family budget, so I haven’t had much testing done, but I am post menopause and 75 lbs overweight with gut issues and suspect great insulin resistance. I have not been able to lose weight since my son was born 16 years ago. I recently discovered a couple of podcasts called Keto talk and Fasting talk by Jimmy Moore and Dr. Adam S. Nally and Dr. Jason Fung. They say many of the same things in their podcasts. On the other hand, I think that you come from a more well-rounded, Functional Medicine perspective because I believe that infections and hormone issues can greatly affect weight loss and even a general health strategy. I may try this on my own for a while but I have a feeling I will eventually be calling your office for help this year! I’m interested in doing anextended fast to treat my SIBO instead of doing the elemental diet. I’ve spent close to $5000 over the past year treating with a practitioner with no results!! So im willing to try extreme measures but am also trying to save money so is true fasting (or using bone broth) instead of the elemental diet just as good? I’ve read a lot of Dr Jason Fungs books about fasting and can’t see why It wouldn’t work in the same way?? Make sure you work with a doctor on this. That being said a true fast should produce results similar to that of an elemental diet on SIBO as there will be literally nothing to feed it. Hope this helps! What length of time would you suggest for a water fast to treat SIBO? 14 days? I just finished reading your book, and am planning to start the great in 8 process. One of my main issues is histamine intolerance, so I am a little concerned about the modified fast at the beginning. Lemon and broth are both triggers that cause severe itching and eczema. Are there any low histamine alternatives? Or do you have any other fasting suggestions? Thanks! First I would recommend heading over to the FAQ webpages for the book. You can find the support page listed on the last page of the book. There are lots of helpful q+a’s over there. I’m not currently aware of low histamine alternatives, but it’s ok to skip this step if you try it and it doesn’t work for you. You could also try Elemental Heal if it doesn’t have any ingredients that trigger you. Good luck!